Are you retired after many years of hard work? Do you want to enjoy your community and people? 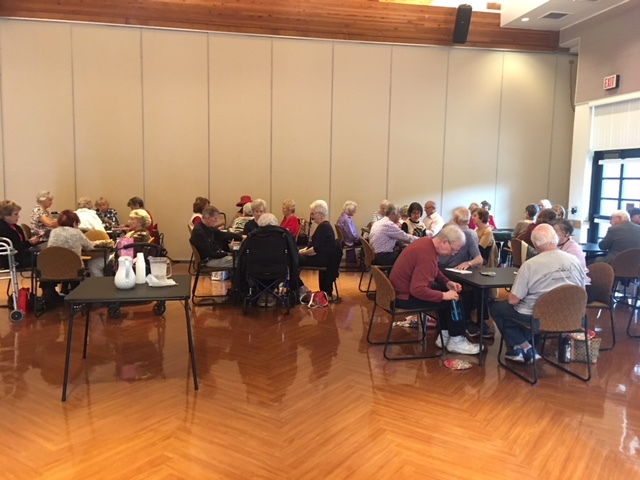 The Laguna Niguel Sr. Citizens Club, located at Sea Country Senior and Community Center, invites you to join us each Wednesday and Friday from 12:15 to 3:45. After exercising your body by taking care of your daily chores, it’s time to give your brain a good workout! –Scientists and Doctors recommendation. Come and meet the members of your community with a good game of “Party Bridge”! We will be happy to welcome you to share our life experiences as well as yours. Don’t be afraid to come alone… we are friendly and hospitable. Marina will return your call! “After a few years ago a close friend talked me into taking bridge lessons at the Sea Country Senior and Community Center. It had been years since I played bridge. Meeting Emil Dinga in the auditorium, he placed my friend and myself in a foursome. It was a surprise to see men enjoy the game as well as women. When Emil had a bad accident at his home, I volunteered to put foursomes together and Larry made the coffee.